So this little soup happened one spring day. It was cooler than normal, and I was in the mood to make something fresh and filling. 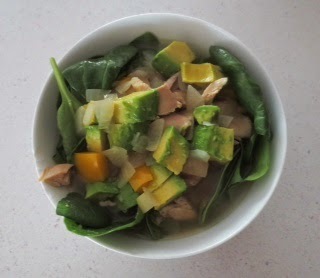 What came out was this clean soup filled with yummy goodness and it took 15 minutes to make. I KID YOU NOT! All you do is chop, sauté, infuse broth and pour over spinach and avocado. If you are vegetarian, feel free to use vegetable broth and leave out the chicken. 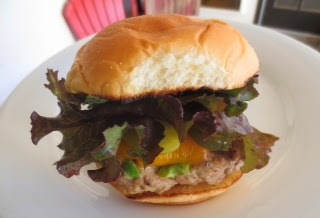 It's another Turkey Burger recipe just in time for grilling season! Whenever I ask my husband for inspiration "hon, what do you want for dinner?" 95% of the time the answer is the same. "How about burgers?" He says it so excitedly as if he didn't suggest it just a few days prior. Now, I'm no burger hater, you should know that by now. But I try to keep things creative and on the healthier side, so most of the time I roll my eyes and tell him thanks for the help and resort to my main dish boards on Pinterest, promising him that we will eventually have burgers, just not every other night. Such a meat man. We balance each other out.